Every year, Montreal based financial firm Arton Capital, measures the number of nations where each passport guarantees visa-free travel. 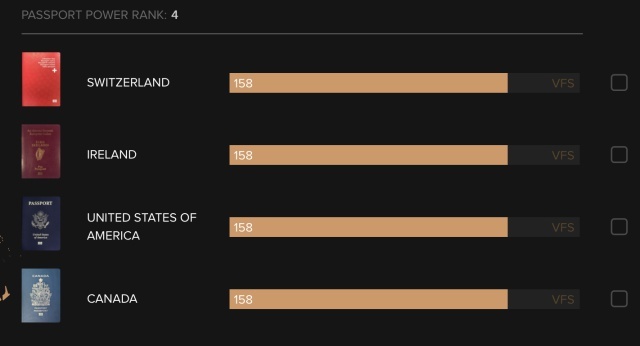 in 2017, the Canadian passport ranked 6th. This year, it moved up a spot and is on par with the American, Swiss, and Irish passport in terms of travel access. As per CTV news, five countries waived visa requirements for Canadian passport holders in 2017, boosting Canada’s visa-free score to 158. Canada sat in sixth place in both 2016 and 2015. The score (158) is representative of how many countries you can get into without a visa. The more powerful your passport, the more freedom you have to travel. The scoring is based on the countries that grant visa-free access to the passport holder. Positive international diplomatic relations also play a role. Check out the Passport Index, here.